Whether you're ready to create the home theatre of your dreams, need a top-of-the-line conference room with the latest technology, or have other audio / video needs, TEAM Electronics will help you create the perfect solution. 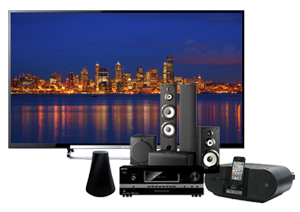 From TVs and projectors to mulit-room surround sound, TEAM has you covered. We can also help you control your audio and video through home automation systems using computers, mixers and routers, as well as custom lighting systems. Contact TEAM for more information today!